Hello Dolly cookies have been a Christmas tradition for as long as I can remember in my home. 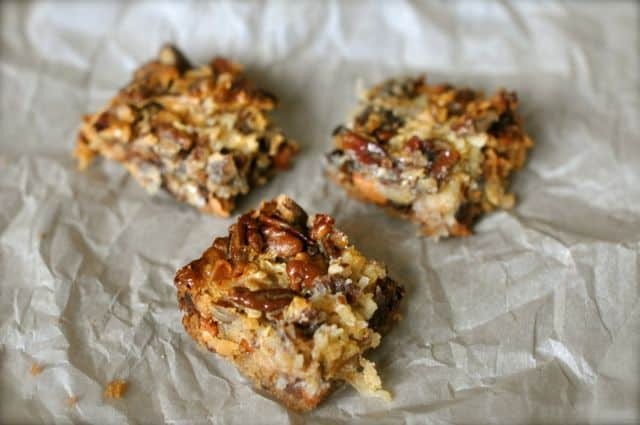 These cookies are also known as seven layer bar cookies have butterscotch chips, chocolate chips, pecans, graham crackers, coconut, and sweetened condensed milk. Christmas tradition for as long as I can remember. These cookies are also known as seven layer bars or magic bars. Whatever they are called, they are deliciously made with butterscotch chips, chocolate chips, pecans, graham crackers, coconut, and sweetened condensed milk. I think these cookies are a real treat because normally we would have never have made something so fancy when doing everyday baking. I can always remember the holidays as the times to cook as fancy as we could, and these cookies were a staple in our cookie gift boxes. Along with chocolate peanut butter balls, pecan sandies, and Chex party mix, Hello Dolly cookies meant it was getting close to Christmas in my house when I was growing up. Why are they Called Hello Dolly Cookies? became a home kitchen staple. What Happened After Refrigeration Appeared on the Scene? After refrigerators began appearing in every home, a way was needed to keep condensed milk selling. So Borden offered money for dessert recipes using his sweet concoction. It worked, and condensed milk has remained a home staple ever since. It’s believed that a recipe called Hello Dolly was combined with Borden’s original street cart recipe and marketed as the magic cookie bar recipe on the Eagle brand label in the 1960’s. Read more about Borden’s story by clicking here. nuts, and condensed milk. Read more about the story of Hello Dolly cookies by clicking here. Love Cookies? Click here for enough cookie recipes to keep you busy forever – and not just during the holidays! Hello Dolly cookies are also known as seven layer bars, no matter what you call them, they are still completely delicious. Melt butter in large pan and sprinkle with the rest of above in order as written. Sprinkle evenly in pan. Pour Borden's Milk over all. Bake at 350 degrees for 30 minutes. After it has cooled cut into squares. Source Virginia McDowell. Jefferson City, Mo. 1966. This is a favorite of mine; we generally make this around X-mas. My mom’s recipe did not call for butterscotch chips (you could add them or not) but the biggest difference was crushed vanilla wafers instead of graham cracker crumbs. I’ve seen many of these recipes but never seen the crushed vanilla wafers except for my mom’s recipe & I loved hers! I would love to try these cookies with the vanilla wafers. I imagine they would add a nice touch.